Of the 200-odd past columns posted on our website, few get more commentary from visitors than “Who will rule the 21st century?," a piece we wrote in 2007 predicting continued US economic leadership, with India and China coming into parity in a matter of decades. As for the question of which country would offer a more attractive environment for foreign investors, we essentially took a pass, saying that only time would tell how well India and China would each capitalize on their huge advantages and handle their complex challenges. Since that column appeared —it’s available on The Welch Way, www.welchway.com—not a week has gone by without our receiving at least a dozen questions that continue to press the matter. Readers have asked: Where should foreign direct investors place their bets? China? India? If both, in what measure? Usually we just set these questions aside, reasoning that there wasn’t much more we could say. Sadly, since the terrorist attacks in Mumbai, there now is. We love India. Its people are bursting with intellect, creativity and positive energy; its entrepreneurs, with rare indomitable spirit. Over the past 20 years, India has proven it can educate managers and front-line workers alike. And while it has struggled with road and energy infrastructure improvements, it has managed to muddle through while making real progress. c1bef894-c430-11dd-94b6-000b5dabf636.flvBut today India is being tested as never before. And in the coming months, the world, and in particular the global business community, will be watching for the answer to a crucial question: whether India can overcome its greatest obstacles to advancement. Not just terrorism, but India’s many well-known internal challenges. Look, like too many other countries today, India is no stranger to terrorist violence. Its Parliament building was infiltrated and at least a dozen people slain in 2001, and countless other terrorist attacks have occurred in New Delhi, Jaipur and the state of Assam, leaving thousands dead. Even Mumbai has been struck before: seven synchronized train bombings in 2006 killed 186. Some of these attacks have been carried out by home-grown groups. But the country is embroiled in a long-standing regional conflict with Pakistan (and, as a result, Afghanistan), and no one can dispute that many of India’s terror incidents have been perpetrated by outside forces. None of this, of course, is news to India’s foreign direct investors. What will be news in the months ahead is how India’s government responds. Because the attacks in Mumbai, striking as they did at India’s financial heart, have shown just how risky doing business in India might become. If other countries’ experiences serve as any indication, India’s future remains hopeful. The events of 9/11 revealed severe weaknesses in America’s homeland security apparatus—just as the Mumbai attacks did India’s—and yet the US swiftly put together a multi-pronged response. Similarly, Spain and Britain bounced back strongly after devastating terrorist attacks in 2004 and 2005, respectively. Their governments redoubled anti-terrorism measures and their people rallied. The people of India will also rally. But even if they have the will to fight back, can the Indian government as well? The changes required in homeland security operations will be massive. The country, for instance, is reported to have only 3,500 intelligence agents for 1.1 billion people. Compare that with the US, where the FBI employs 13,000 special agents for 300 million residents. Perhaps more daunting is the issue of whether India, with its 22 official languages and dozens of disparate political parties, can implement the needed changes with due expertise and speed. The country is currently led by an honourable man, Prime Minister Manmohan Singh, but his toughness has always been an issue, and with elections several months away the opportunities for political mischief will be many. Moreover, India’s ability to execute a complex, coordinated programme could very well be hobbled by the country’s byzantine bureaucracy, which too often operates as little more than an employment agency. With such a mixed picture, all that foreign companies can really do right now is provide their people with additional security—and wait. In the meantime, some investors are sure to think about tilting the balance to China. That’s understandable. Despite persistent worker protests, the Olympics this past summer left little doubt about the country’s ability to manage itself on a massive scale. But China isn’t really India’s biggest economic challenge right now. India is. How its leaders respond to the Mumbai attacks will tell the business world what it wants and needs to know—not just whether they should pull back from India, but just how risky pushing forward will be. Jack and Suzy are eager to hear about your career dilemmas and challenges at work, and look forward to answering some of your questions in future columns. 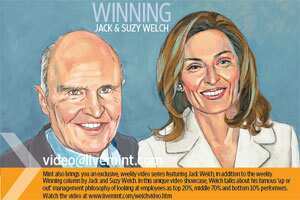 Jack and Suzy Welch are the authors of the international best-seller, "Winning. Mint". Mint readers can email them questions at winning@livemint.com. Please include your name, occupation and city. Only select questions will be answered.